SIOUX FALLS, S.D. – Toby Inman couldn’t remember exactly the last time he won a freestyle bullfight. He won’t have that problem anymore after his Bullfighters Only performance on Friday and Saturday during the Sioux Falls Premier Rodeo. 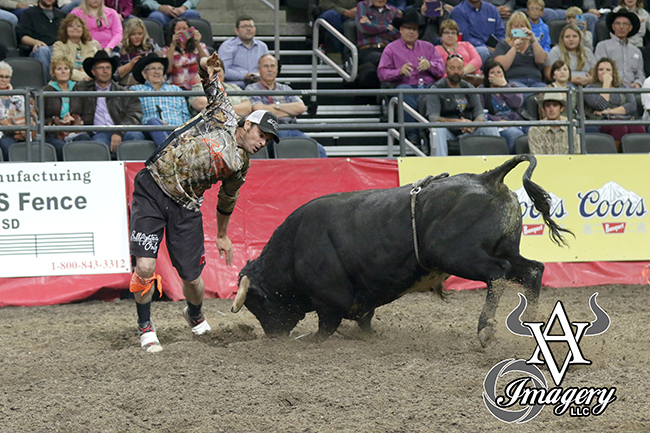 He posted the highest score of the weekend on opening night with an 89-point fight while dancing with War Fighting Bulls’ Ghost Face. He followed that with a solid 84 on Saturday to earn the event title with a cumulative score of 173 points on two fights. “Friday night was a big deal to me, because I had a good bull, I cracked out and enjoyed it,” said Inman of Davis Junction, Ill. “My Saturday night wasn’t so great, but Friday night was something I needed. It was. The 89 is one of the highest scores of the inaugural Bullfighters Only season. Inman started by jumping Ghost Face, then threw in a couple of strong fakes that sent the bull sliding past. He made a few rounds, turning his back to the animal and showing great control. He finished the fight with a fake that dropped both him and the bull to their knees. It was a true showcase of Inman’s abilities, even though it’s just the third bullfight he’s competed over the last five years. “I would say the first two bullfights, I was still trying to figure everything out,” he said. “Being in a good arena with a big crowd was definitely great. When you call for the bull, all that noise goes away and it doesn’t matter. It’s just you and the bull. It was a weekend filled with exceptional talent, with Inman and Ross Hill of Muscle Shoals, Ala., serving as the veterans and 20-year-old Dakota Knight of Lebo, Kan., bringing a fresh face to the game. While Inman won the average title, Hill and Knight split the final-night victory with 86.5 points each. Knight is a second-generation bullfighter who got his start at a very young age. He followed his dad around the rodeo trail and had several opportunities to refine his game at a young age. His talent showed in Sioux Falls. It served as the perfect setting for a brilliant night of Bullfighters Only.